that girl in the wheelchair: Mac-Over Part Two: Keycal review and giveaway! So I bet after you read part one of my self proclaimed Mac-over aka the Slickwrap saga, that there was nothing more to say about the process of spiffying up a laptop. You were wrong. Although my black keys [Tangent: Not to be confused with the band. I know you weren't confused...and my clarification is unneeded. Oh well. ] are in pretty good shape, I have seen on several forums that the oils from your fingers can cause the numbers to fade and wear off. [Tangent: Damn finger oils!] 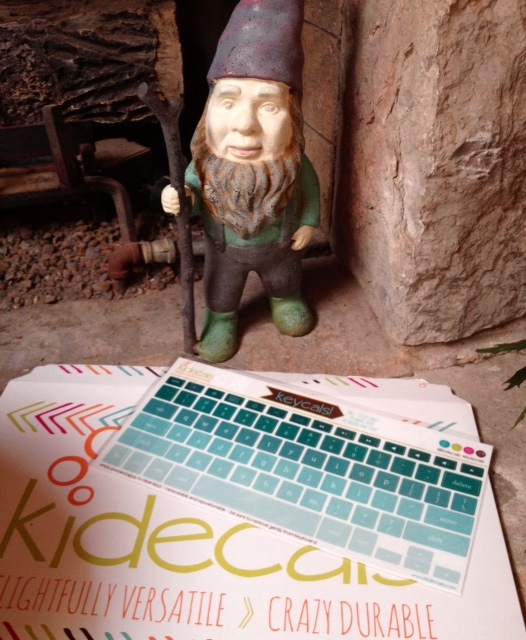 Because that prospect is a scary one and because you know I freak over a cute sticker like a 4th grade girl- I decided that I would give keycals by kidecals a test drive. Although there wasn't a lot of instruction with the packaging, they are basically mini stickers, so thus pretty easy to apply. I did find that depressing the keys completely when placing the stickers made them slightly easier to center, but they were definitely more dummy proof than the first step of the Mac-over. It took maybe 15 minutes and I could easily accomplish it while watching TV. [Tangent: More specifically Toddlers and Tiaras. I have only really ever seen one episode prior to yesterday when I fell headlong into a the marathon vortex on TLC. In fact, I had to remove myself from the house to get myself away from it. One of the little girls was 4 and drinking coffee every morning and another one was the daughter of 2 parents who ran a stripper rental service and at one point in the video package, the little girl asked a group of exotic dancers to show her some moves for the pageants. Even admitting that I watched this makes me feel itchy.] ...and look how pretty the results are. 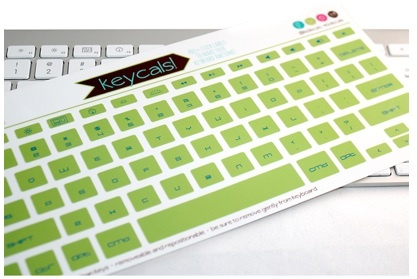 So, I bet you want some keycals of your very own! Well, you are in luck. As promised by my ultra feminine April giveaway, this one is a bit more unisex. Keycals has given me a set of their green game bot keycals , which I love because they remind me of Number Munchers for some reason, to give away to a reader. 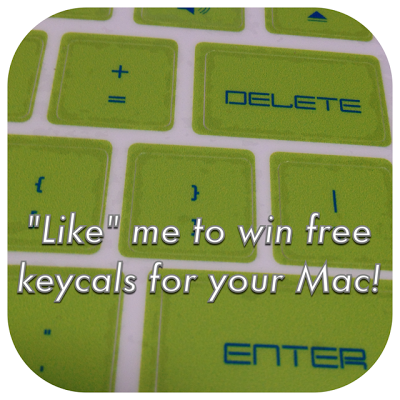 [Tangent: Hopefully I have lots of Mac Users who want em!] I'm also including a cleaning cloth to dust and clean off our 'puter from the folks at SlickWraps. 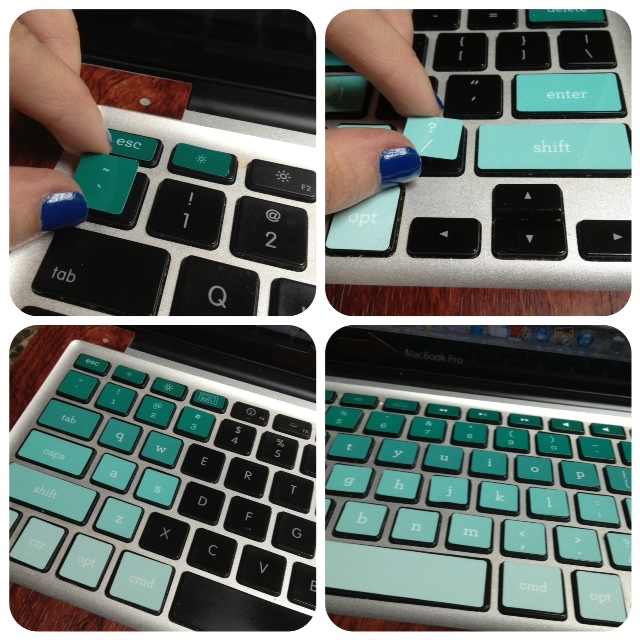 This way you can have a mini Mac-Over of your very own. In addition to giving me an awesome set of keyboard labels to giveaway, they have also given my readers this exclusive offer. Using promo code : awesomelabels, you can save 15% on their merchandise at http://kidecals.com . Shipping is always free, so you are getring a fairly sweet deal. First comments never win contests, do they? Gonna try anyway! Those stickers are cute. I think that a lot of us are turned into eight year old girls when we see stickers - and they help us forget about finger oils. God...worst makeover story. Do you want fashion makeover...or home makeover...or life makeover...? I'm just going to wing it. I once let a hairdresser (and I'm using that term loosely) die my hair red. It came out kind of a copper yet somehow also yellow color. I looked like a tired, worn-out farmyard hen. At SPACE CAMP, every morning all the girls would get together and put on makeup and do each other's hair. I was in the 6th grade or something, so I had never really worn makeup before but some girl had it and we all used it. Nasty. We looked gross. Also, a girl (probably the same girl) brought her curling iron and curled everyone's hair each morning. ANYWAY. We looked like tiny little painted whores AND I ended up getting scabies or some other kind of infectious rash all over my scalp from the curling iron and I had to go to my pediatrician for antibiotics the next week. But it was worth it because I got to go to SPACE CAMP. I think by nature, being on your own devices at camp is the key time to get tarted up. I know that's the first time I wore mascara!